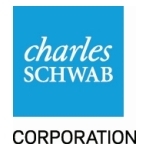 SAN FRANCISCO--(BUSINESS WIRE)--The Charles Schwab Corporation announced today that its net income for the first quarter of 2016 was $412 million, comparable to $416 million for the fourth quarter of 2015, and up 36% from $302 million for the first quarter of 2015. New retail brokerage accounts for the quarter totaled approximately 163,000, down 8% year-over-year; total accounts were 6.9 million, up 3% year-over-year. Held financial planning conversations with approximately 34,000 clients during the quarter, up 36% year-over-year. Launched our voice ID service, enhancing both the safety and convenience of interacting with Schwab. Biometric technology allows clients to quickly and securely authenticate over the phone simply by saying a passphrase. Schwab Trading Services™ hosted an interactive online trading event for 3,600 clients and prospects, featuring a conversation with Alan Greenspan, a panel hosted by Schwab traders, and a presentation on profit-taking techniques. Launched a new online account opening process with streamlined steps and mobile-optimized viewing, enhancing the experience for clients using the web or a mobile device. Engaged over 1,300 advisors on the topics of cybercrime and fraud. Advisor Services conducted two webcasts and seven regional events educating on current trends and sharing best practices for strengthening security programs. Enabled advisors and their clients to conveniently view Pledged Asset Line® account details – including balances, transactions and statements – directly within Schwab Advisor Center® and on the Schwab Alliance™ website. Schwab Intelligent Technologies® and Orion Advisor Services introduced several integration features, including the ability to view account information and transfer funds using Schwab OpenView Gateway®. Introduced a new Service Guide resource on Schwab Advisor Center where advisors can easily search how-to articles for completing common account servicing tasks on behalf of clients, and bookmark articles for future use. Hosted over 1,200 advisors for a webcast detailing upcoming changes related to the Securities and Exchange Commission’s money market fund reform as well as Schwab’s updated Cash Features Program. Balance sheet assets = $147.0 billion, up 24% year-over-year. Outstanding mortgage and home equity loans = $11.1 billion, up 1% year-over-year. Pledged Asset Line balances = $3.3 billion, up 32% year-over-year. Delinquency, nonaccrual, and loss reserve ratios for Schwab Bank’s loan portfolio = 0.21%, 0.20% and 0.23%, respectively, at month-end March. Schwab Bank High Yield Investor Checking® accounts = 856,000, with $13.2 billion in balances. Client assets managed by Windhaven® totaled $11.1 billion, down 29% from the first quarter of 2015. Client assets managed by ThomasPartners® totaled $7.8 billion, up 10% from the first quarter of 2015. Client assets managed by Intelligent Portfolios (Schwab Intelligent Portfolios and Institutional Intelligent Portfolios) totaled $6.6 billion, up $1.3 billion from the fourth quarter of 2015. Launched Goal Tracker, a Schwab Intelligent Portfolios feature where clients set and track progress toward an investment goal. Goal Tracker projects portfolio performance in a variety of market conditions. Expanded Schwab ETF OneSource to offer 14 more ETFs; at quarter-end, investors could trade 225 ETFs from 16 providers covering 66 Morningstar Categories, for $0 online trade commissions. Partnered with American Express to launch two co-branded cards designed for Schwab’s diverse client base: a credit card and a premium charge card. Both cards offer rewards, benefits and services, including unlimited cash-back features. * For program information and details about how we make money on Schwab Intelligent Portfolios, see intelligent.schwab.com and the Disclosure Brochures. 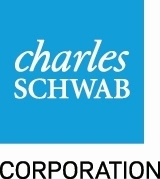 Schwab Intelligent Portfolios is offered through Schwab Wealth Investment Advisory, Inc. Institutional Intelligent Portfolios is made available through independent investment advisors and is sponsored by Schwab Wealth Investment Advisory, Inc. 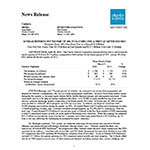 This press release contains forward-looking statements relating to client demand for Schwab’s wealth management capabilities, including advisory solutions; earnings power; expense discipline; profitability; reinvestment for growth; the timing and amount of transfers relating to money fund reform; and bank deposit growth. Important factors that may cause such differences include, but are not limited to, client use of the company’s investment advisory services and other products and services; the company’s ability to develop and launch new products, services and capabilities in a timely and successful manner; general market conditions, including the level of interest rates, equity valuations and trading activity; the company’s ability to attract and retain clients and grow client assets/relationships; the level of client assets, including cash balances; competitive pressures on rates and fees; the quality of the company’s balance sheet assets; capital needs and management; the company’s ability to monetize client assets; the company’s ability to manage expenses; the timing, amount and impact of bulk transfers; client sensitivity to interest rates; regulatory guidance; the effect of adverse developments in litigation or regulatory matters and the extent of any charges associated with legal matters; any adverse impact of financial reform legislation and related regulations; and other factors set forth in the company’s most recent reports on Form 10-K and Form 10-Q. Includes fee waivers of $97 and $184 for the three months ended March 31, 2016 and 2015, respectively, relating to Schwab-sponsored money market funds. (2) Includes all client trades that generate trading revenue (i.e. commission revenue or principal transaction revenue); also known as DART. Certain prior-period amounts have been reclassified to conform to the 2016 presentation. Note: Beginning in the second quarter of 2015, certain changes have been made to the above categorizations of both balances and revenues in order to provide improved insight into asset management and administration fee drivers. Prior period information has been recast to reflect these changes. (2) In the third and second quarters of 2015 certain Mutual Fund OneSource balances were reclassified to Equity and other securities and Other third-party mutual funds, respectively. Prior period information has been recast to reflect these changes. (4) In the fourth quarter of 2015, the Company realigned its reportable segments as a result of organizational changes. The Corporate Brokerage Retirement Services business was transferred from the Investor Services segment to the Advisor Services segment. Prior period segment information has been recast to reflect this change. (5) In the first quarter of 2015, the Company increased its reported totals for overall client assets and retirement plan participants by $6.1 billion and 35,000, respectively, to reflect the final impact of the consolidation of its retirement plan recordkeeping platforms as previously announced in September 2013. (6) Fourth quarter, third quarter and second quarter of 2015 include inflows of $10.2 billion, $4.9 billion and $17.4 billion, respectively, from certain mutual fund clearing services clients. (7) First quarter of 2015 includes an outflow of $11.6 billion relating to the Company's planned resignation from an Advisor Services cash management relationship.